This is an amazingly easy, yet super healthy, gluten-free pancake recipe that my kids (2 & 4) love! We call it Pancake Nirvana. 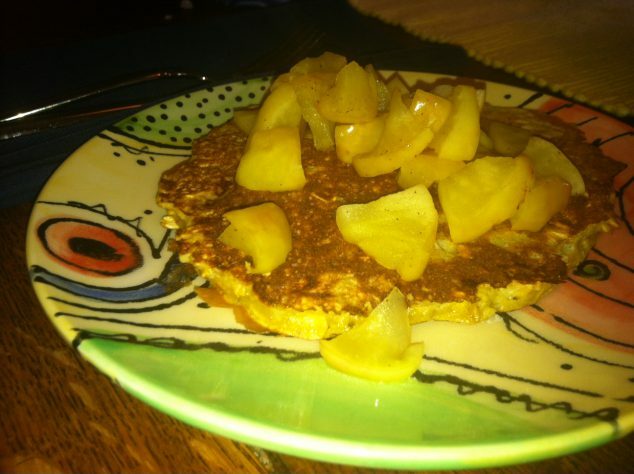 I like to serve these flour fee pancakes with turkey sausage and diced apples. In a small mixing bowl, mash one banana. Add two whole eggs, 1/2 tsp. ground cinnamon and 1 tsp. vanilla; whisk well to combine. Stir in 1/2 c. plain, uncooked oats and let rest for 2 minutes. Spoon 4, 1/4 cup portions of mixture onto hot, greased griddle and fry. While pancakes fry, dice one apple into a microwave safe bowl. Top with 1/2 tsp. ground cinnamon and 1 tsp. pure maple syrup and stir. Microwave apple on high for 90 seconds. Serve pancakes with apple topping. This makes 4 kid servings or 2 adult servings of gluten-free pancakes. I hope you family enjoys these pancakes? What is your favorite breakfast recipe? Guest post by Jen Sieve-Hicks, Co-Founder of KIDzOUT, a mom based app for families on the go!